These days, the average person’s attention span is shorter than the attention span of a goldfish. Brands have eight seconds to catch their audiences’ eyes online before losing their attention. What better way to hook them than with strong visual branding that tells a compelling story? Without effective visual branding, companies don’t stand a change in today’s oversaturated media market. People are bombarded with messages daily thanks to the digital age opening new doors that enhance content sharing, and information overload due to content clutter is extremely common. The result is that audiences ignore most messages – and they’re sure to ignore those without strong visuals. Branding helps break through the clutter, distinguish a company from its competitors, create emotional connections with consumers and cultivate brand loyalty. Visuals are essential in this regard, especially with the importance of social media. They evoke reactions from consumers that are unique to the brand and help them remember it. Further, when it comes to consumer decision-making, most people tend to go with their gut. Consumers are typically more emotional than rational. Their feelings and relationships have major influence over their behavior. Companies seeking to get results in their marketing should focus on building a relationship with their customers and appealing to their emotions. A strong visual brand identity that creates a strong positive association in consumers’ minds is key to this. To understand visual brand identity, it’s crucial to first break down the term “brand.” David Ogilvy, known as the “Father of Advertising,” defined it as “the intangible sum of a product’s attributes.” According to modern definitions, brand refers to an audience’s perception of – or relationship with – a company or organization. Brand identity is the message an audience receives that drives their recognition of a brand. And visual brand identity is comprised of the visual components that give a brand cohesive personality, distinguish it from competitors and influence audience perceptions. Before you begin experimenting with visual branding, you must first decide which category of personality your brand falls into. 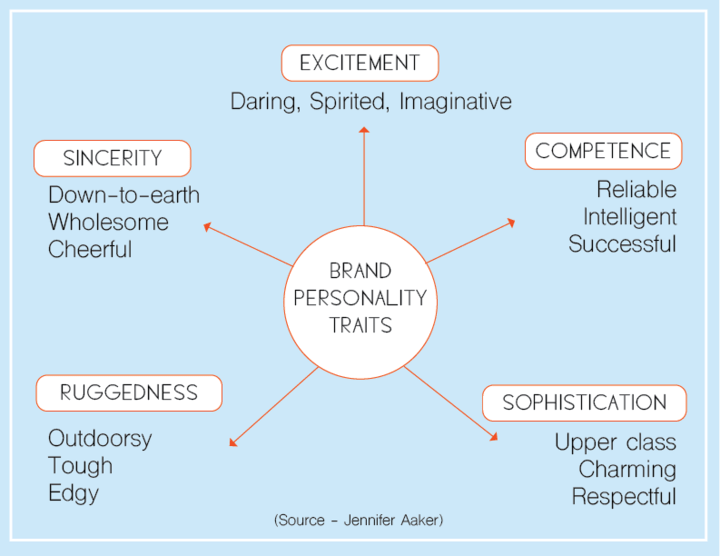 Psychologist and Stanford professor Jennifer Aaker has laid out five key personality traits for brands: Sincerity, excitement, competence, sophistication and ruggedness. Some brands might overlap between two of these, but most fall into one. Start by outlining key characteristics of your brand, then match them up with the personality traits. Once you decide which of these traits your brand falls under, you can select its visual components accordingly and will have an easier time deciding how to convey its identity. What are the components of a strong visual brand identity? An effective visual brand identity includes consistent visuals across its brand name, logo, font, colors, photos, graphics and videos. All of these should be distinctive but still contain components that unite them to ensure the brand is cohesive. 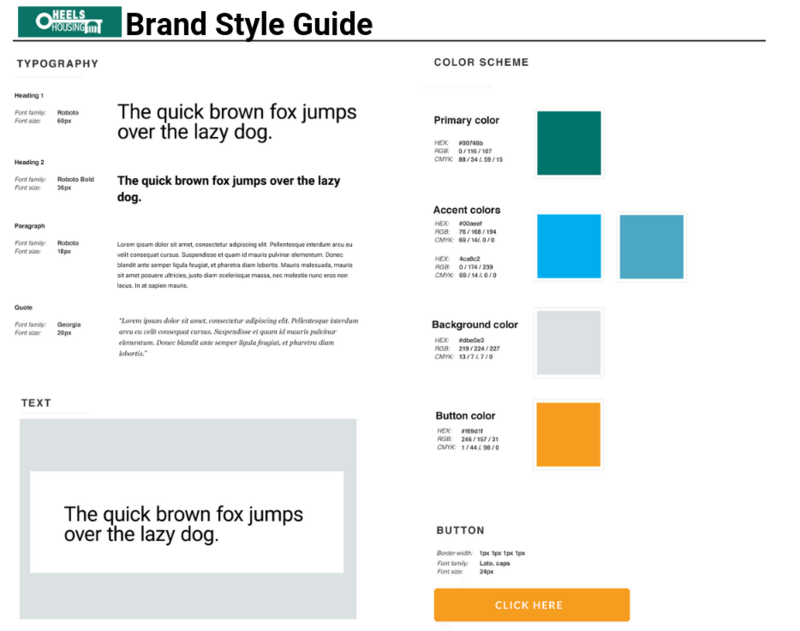 A brand style guide helps maintain this visual consistency across all branding. A brand’s name and logo essentially serve as its face. They are the first thing people associate it with. The name and logo should be unique and recognizable enough to stand out among the sea of brands that already exist. Lettermarks or monogram logos. A company with a long name might consider using a lettermark, including their initials in an acronym (e.g. CNN, HBO). Wordmarks or logotypes. Brands with concise names (e.g. Google, Coca-Cola) can use their names as logos. Pictorial marks or logo symbols. These logos consist of simple graphic icons with a recognizable image (such as those of Twitter, Appleand Target). Abstract logo marks. These logos are similar to pictorial marks, but the icons are original shapes (such as Nike or Pepsi). Mascots. These logos are more playful and use illustrated characters (e.g. KFC). Combination marks.These logos incorporate multiple of the aforementioned elements. Emblems. These are logos that incorporate a font inside of an icon (e.g. Starbucks). The color palette a company chooses can be powerful. Colors have a major influence over people’s behavior in daily life –ust look at traffic lights. An obvious example of a brand that’s effectively harnessed the power of color is Coca-Cola, whose association with red is so recognizable, it’s an almost automatic mental connection. According to one study, up to 90 percent of consumers’ snap judgments about products are based on color. Another found that a color’s perceived fit with the product it represents makes a major difference. Therefore, your brand colors should match the overall feel of what you’re selling. In terms of selecting a color palette, the amount you select matters just as much as the shades themselves. Too many colors will overwhelm audiences and muddy your brand identity, so stick to two or three primary colors and one accent. Try to stay at four colors or fewer. Use RGB colors for digital content and CMYK for print, as CMYK colors can appear muddy on screens. If you need premade color palettes, ColourLovers.com and Kuler.Adobe.com have some attractive options. People are 65 percent more likely to remember information when it’s accompanied by an image. The images representing your brand should be consistent with your company’s brand personality and message. They also should build a narrative that appeals to the community they’re targeting. Imagery should elicit an emotional or rational response that leads to resonance, or a strong relationship between your brand and target audiences. All photos should be high-quality. This is especially crucial in the age of social media –brands that share high-quality photos experience significantly higher response rates on Facebook and Twitter than those that don’t. It’s a good idea to either invest in a stock photo subscription, hire a photographer — the 1893 Brand Studio has several — or find another way to capture good photos that strike a chord with potential and current customers. Graphic design simplifies the complex by combining words, images, colors and hierarchy to quickly and effectively convey messages. Graphics can be used on social media, flyers, websites, business cards, logos and more. They can tell a story in a few seconds in a way that aligns with a brand’s mission, vision and personality. Good graphic design with appealing visuals can have a major impact on business. Companies that prioritize quality graphics have been shown to financially outperform those that don’t by 200 percent on the Financial Times Stock Exchange. Fifty-five percent of people watch online videos daily, according to Digital Information World. And 83 percent of consumers would consider sharing video content with friends if it pertained to their interests, reports a HubSpot study. Video is a strong medium for brands to express their authentic personalities, gain viewers’ trust and boost engagement. This engagement might include shares, lead generation, click-throughs and sales. Videos are widely recognized as one of the most popular forms of content on social media. Facebook, for instance, saw an average of 8 billion daily video views at the end of 2015. Instagram is a major avenue for video content, as well. The shorter, the better when it comes to video. Thirty-second spots are becoming increasingly popular. Videos should evoke emotional responses and spark conversation. They should be compelling, unique and shareable. A lot of people tend to watch social media videos on mute, so it’s always a good idea to include strong visuals and captions. There are several tools available to build the elements of your brand identity, both free and paid. Adobe Creative Suite is a popular all-inclusive choice, as it includes Photoshop (for photo editing), Acrobat (for PDFs), Premiere Pro or After Effects (for video editing), InDesign (for publishing and layout) and Illustrator (for graphic design). Infogram makes it easy to develop visual graphics that convey data and information in a way that captures audience’s attention. This includes infographics, reports, charts, maps, and social media visuals. It offers a basic free version and several pricing options for pro, business, team and enterprise. PicMonkey is an intuitive graphic design and photo editing app that allows users to create attractive visuals such as logos, social media graphics and attractive photos. It offers a free trial as well as paid basic and pro subscription plans. For a free photo editing alternative, try Ribbet. Canva is a simple design tool whose mission is “empowering the world to design”. It offers templates for any type of material a brand could need, as well as free shapes, images, fonts and more. Users can upload their own images as well. Canva is free with somewhat limited functionality but also offers a paid version with extended features. Adobe Spark allows users to easily create compelling graphics, video stories and web pages with minimal effort. This free tool offers themes, music, fonts and more to enable easy creation of key visual brand components. There are also paid versions available with premium features. The 1893 Brand Studio boasts a talented team of photographers, videographers, graphic designers and more to meet your company’s visual branding needs. Our team has extensive knowledge and valuable experience in visual branding and storytelling. Check out our past work. Contact us today for help with your company’s visual branding. ← What is Social Media Advertising?